We are here to help you make sense of your signage and engraving needs. Specializing in ADA Compliant signage, engraved signs and ID products, we can assist you with large scale sign projects as well as small quantity orders of name plates or name badges. Since 1979, we’ve been the company you can turn to when you need custom signs, name plates, name tags. Through the use of quality products we offer the highest quality signs at competitive prices. As a family-owned and operated company, we work closely with our customers to understand their needs and desires and offer innovative solutions to their Identification, Wayfinding and Signage needs. We pride ourselves on personalized service and we truly enjoy helping our customers succeed. We approach each order and project with care and passion in order to provide the quality products our customers deserve. Identification products and signage play a big role in the image of your company, church or organization. Our job is to help you and your facility look your very best. We use the industry preferred rotary engraving method to produce high quality ADA signage in custom colors, sizes and shapes to match any decor. 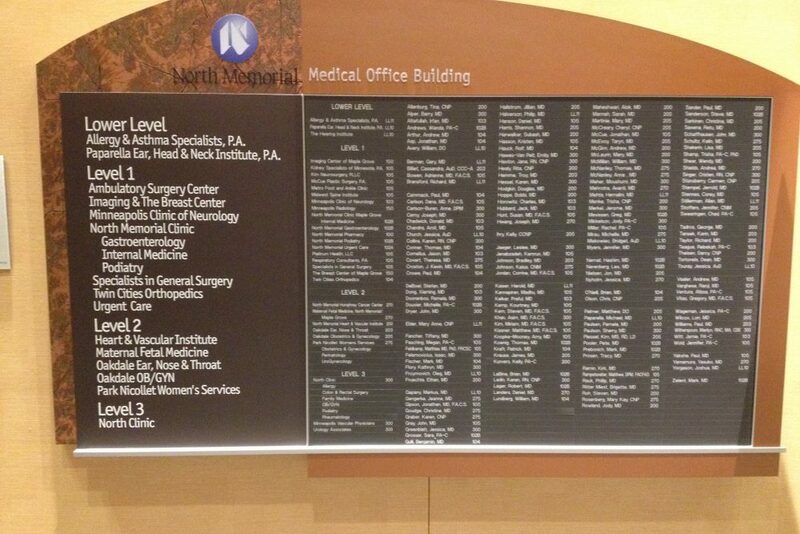 We create building directories and wayfinding signs for large and small facilities. We can design & create signs for a new facility or add signs to your existing facility. We create engraved name badges, name plates and other Identification products. Choose from a wide variety of colors and fonts to personalize you ID products.